Nothing captures the spirit of the wild west better than the sight of bison roaming the plains. And there’s no better place to count on seeing bison than Yellowstone’s Lamar Valley. This area is home to the purest bloodline of bison, or buffalo, dating back to prehistoric times. Finding them is as easy as driving through the Lamar Valley, and looking around. 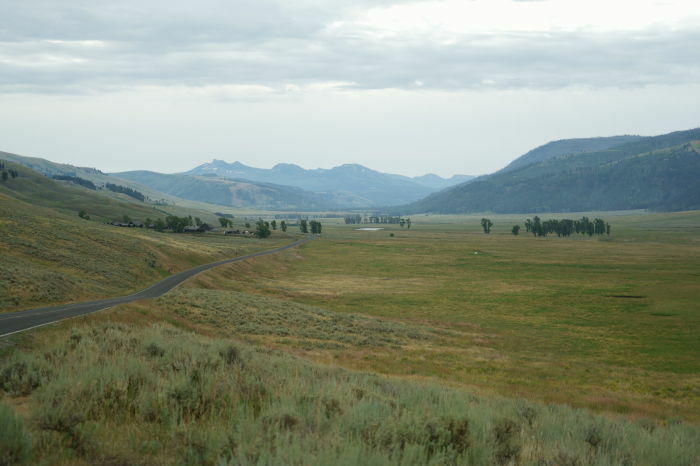 The Lamar Valley is located on the northeast side of Yellowstone National Park, between the Tower-Roosevelt junction and the northeast park entrance. In the summertime, you can count on traffic jams on the roads of Yellowstone National Park. But sometimes, they aren’t caused by slow-moving RV’s. 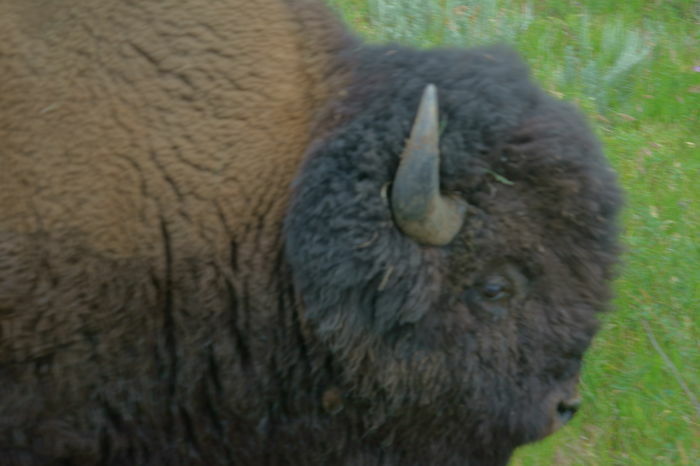 … but you’ll probably also come upon a large herd of bison, gathered in a wide-open field, rolling around in the dirt. During late July and August, the boys and girls mingle, as the bulls try to find mates. That’s part of the reason for the wallowing — to impress the ladies. They also fight with other bulls and make some bellowing sounds to express their dominance. 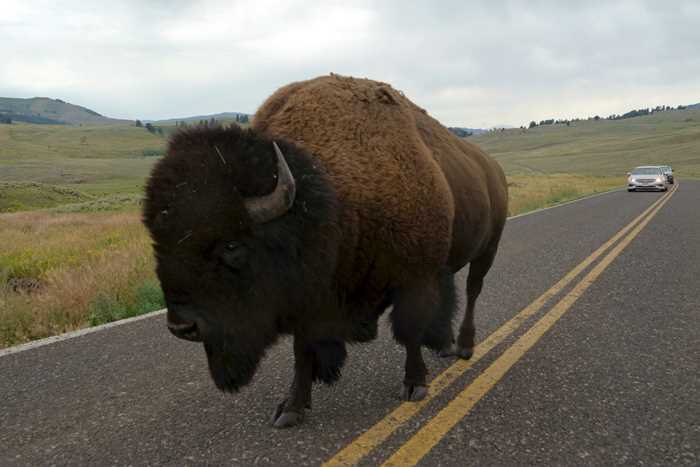 The best way to get up-close to bison is to stay in your car and wait for one to walk by. You do NOT want to approach them. You cannot outrun them, and it would be most unpleasant to be butted or trampled by one. If a bison raises its tail, that means it’s agitated and getting ready to attack. Back off. 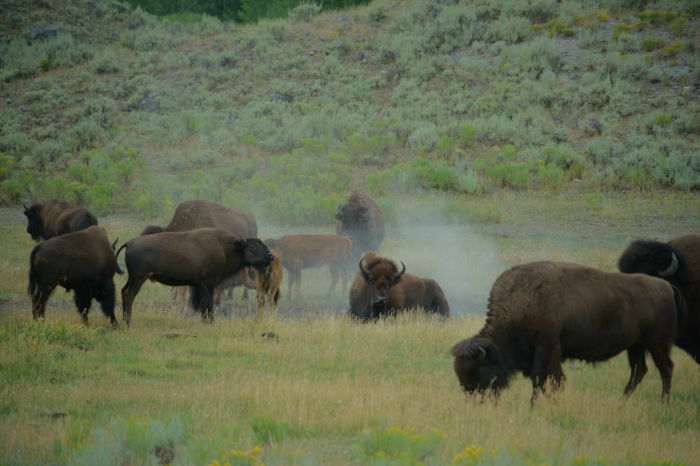 Yellowstone’s bison herd once dwindled to just a couple dozen animals. Aggressive conservation efforts have multiplied those numbers, and now the number of bison in Yellowstone fluctuates between 2,300 and 5,500. Not all of today’s Yellowstone Bison are descended from those few survivors, though. Some bison were brought in from other areas. Even so, the Yellowstone herds have been kept free from cattle genes. Aside from the occasional appearance of a bison herd, and the unspoiled natural beauty throughout the Lamar Valley, there aren’t many attractions on the map in this area. The park road takes you through the Lamar Valley on the way to Tower Fall and Roosevelt Lodge — well-developed areas of the park. But out here, there are just a few turnouts and an occasional picnic table. If you want to see bison, there’s no better bet than a drive through the northeastern corner of Yellowstone, in the Lamar Valley. Keep a safe distance and enjoy these majestic creatures in their natural environment.